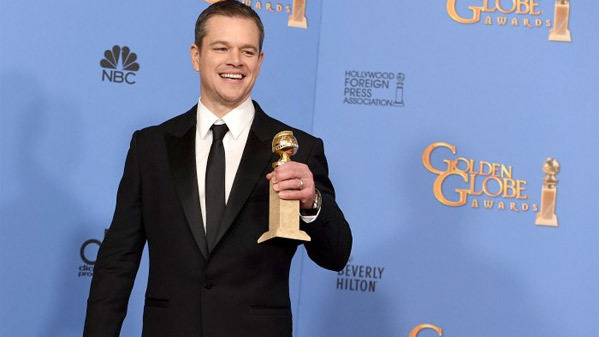 The winners of the HFPA's 73rd Annual Golden Globe Awards, the precursor to the Academy Awards, have been announced tonight at a ceremony held at The Beverly Hilton hotel, hosted by the always hilarious Ricky Gervais. Hopefully he makes this night go by fast, as the HFPA can always be a bit boring. Our list below will be updated with all film-related winners as they're revealed during the live broadcast. The nominees featured a number of great films from 2015, but they had a few odd picks thrown in as usual, and I'm intrigued to find out which stories/actors the HFPA fell for this time. 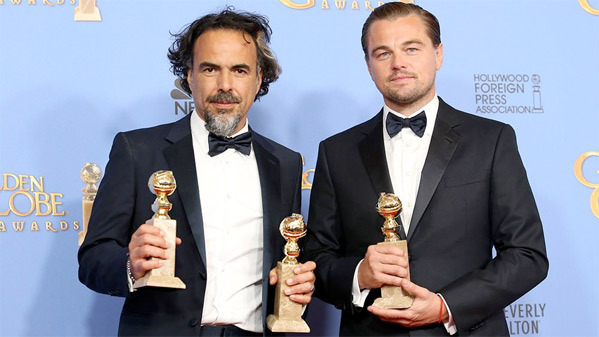 Find out who took home Globes! The 73rd Annual Golden Globe Awards are being held at The Beverly Hilton hosted by Ricky Gervais with a live telecast airing on NBC. The full list of 2016 winners below. Winners highlighted in BOLD. Thoughts: Well, there you go. Personally, I would've chosen Mad Max: Fury Road, but I think all of these films would've been deserving winners. I actually like The Revenant, it's a helluva film, but I'm not so sure it's the Best Film of the Year. Thoughts: Go Leo! 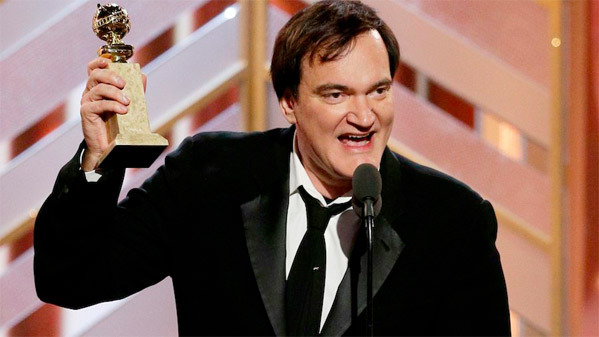 Hey, he gets a nice win (he also won for Wolf of Wall Street). I really think he's fantastic in this film and I'm glad he ended up winning, though I have to say - every other performance here was worthy of winning, too. 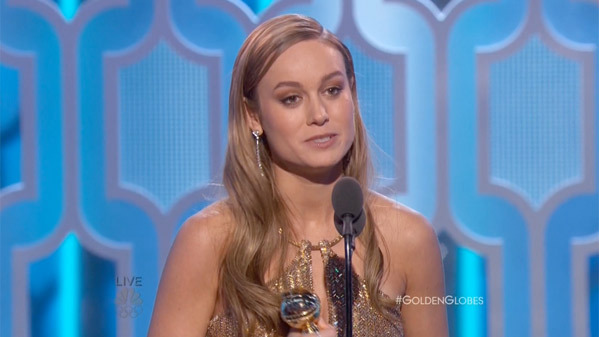 Thoughts: Brie is a very talented actress, and I hope this gives her the chance to go on to so much more. Thoughts: It's a good film, so it's fine to win this (I would've been happy to see The Big Short win as well). First thing Ridley Scott said when he got to the mic was: "Comedy?" Even he's wondering why that is the HFPA's category for this, but since it won he'll take it. Thoughts: Well, there you go, Damon it is. He's fun in the movie, so it's no surprise he won this one. Thoughts: Haven't seen the film yet, but I prefer other comedic performances this year. Thoughts: Incredible film. Hope it goes on to win the Oscar next because it's one of the best films of 2015. Thoughts: Hooray to Pixar! A deserving win, this is one truly unforgettable film and I'm happy for Pixar. Thoughts: Hell yes! Go Sly! Onwards to the Oscars next? We'll see. He's soooo damn good in Creed! Thoughts: Surprise! She's wonderful in the movie! I'm fine with this, or Vikander. No complaints here. Thoughts: As much as I enjoyed The Revenant, I really think George Miller (or Ridley) should've won this. Thoughts: I should say I'm not surprised it was Aaron Sorkin. The script is extraordinary, no doubt about that, but so are the other scripts. Especially The Big Short, which is a brilliant film (same with Ex Machina). Thoughts: It's Ennio Morricone! How can anyone argue with him? It's an excellent score, I quite like it. Thoughts: Wow. The worst choice from the HFPA so far. Really? This song is awful, doesn't deserve to win, and I'm not even sure how it won. Every other song nominated here is better. Oh well. Final Thoughts: I was not expecting The Revenant, but I don't mind, I think it's a great film. However, it's not really the best film of the year, and I think most know that. This is just typical HFPA wackiness, they always choose some weird winners and that's certainly the case again this year. 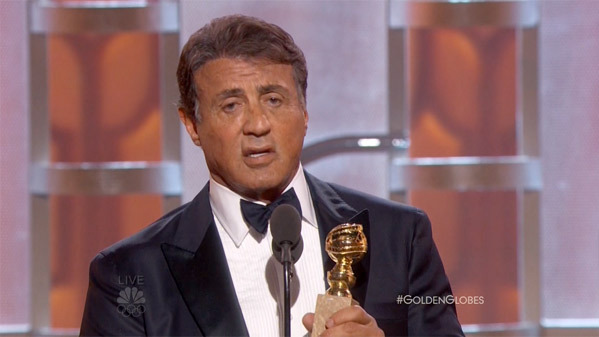 My favorite winners: Sylvester Stallone for Creed, because he's outstanding in the film and it's the only award this film will (probably) get and I love it; and Matt Damon in The Martian, since it's such an entertaining film and they had to give it love in some category, so why not musical or comedy (despite not being a comedy). Other than that, my least favorites are the Best Song winner and Brie Larson being chosen over Saoirse Ronan. Oh well. What do you think of the 2016 winners? How is the show this year with Ricky Gervais? Is it funny? Are these winners an early indicator for Oscars, or not? What favorite movies from 2015 are you rooting for? Way to go Sly!! Also, am I the only one who really didn't like Carol that much? Haha, I wouldn't mind hearing different opinions. I mean, I definitely didn't completely hate it. The performances were pretty good, but I never felt any real chemistry between the 2. Maybe it was meant to be like that based on the time period the film takes place. Something like that was just very different, Rooney's character just didn't know what to do/feel. That aside, up until THE scene, it just felt too slow, almost no tension leading up to it. Just awkwardness. I will, however, say that the 2nd half of the film after that turning point, so to speak, was quite nice. I actually felt more emotion from the 2 mains. And like you said, it was definitely beautifully shot. No one cares about the golden globes. Ricky was right, they are worthless. I wish the oscars would move up to January, put the foreign press out of business. Or just do away with awards altogether? No, I think awards are effective at promoting excellence. And while the Oscars aren't perfect, I'm happy with their nominations and winners most of the time. But the golden globes are more about jumping on band wagons and promoting what's already popular rather than what has artistic excellence. Truth. Always get it out of the way, then on to Oscars. How Sly did not thank Coogler and Jordan....strange. Good one for Ridley. Glad Sly won too and totally agree with original song. Can't stand that song lol. Should have been "See you again" at least that's all I can really remember from FF7. Oh man The Martian as a comedy rofl. Someone has lost their minds. Best Director was a bit odd, yeah should have been Miller or Scott.